Starting the day tired and groggy means you are less likely to make the best decisions about your health. When you feel exhausted, it is easier to order a pizza or put a frozen dinner in the microwave than it is to take the time and effort to create a healthy and balanced meal. Likewise, feeling tired means you are less likely to hit the gym or go on your morning run. It should be no surprise then that lack of sleep has been linked to higher rates of obesity. Until the fountain of youth is discovered, adequate sleep will remain one of our best ways of staving off some of the worst effects of aging. Sleep is rejuvenating; it reduces stress and keeps us healthy, which is likely why a lack of sleep has been linked to advanced aging. Not getting enough sleep, for example, can lead to faster skin aging and even permanent damage to brain cells. One of the most obvious short-term effects of sleep loss is stress. Simply put, when we don't get enough sleep, we are more likely to go through our day feeling "on edge." Stress is not just an unpleasant feeling, it also leads to some serious long-term health risks, namely heart disease and stroke. Getting an extra hour of sleep each night won't just calm your nerves, it will also reduce your risk of suffering from a heart attack or stroke later in life. Because sleep loss has such serious health risks, it should come as no surprise that people who don't get enough sleep are more likely to suffer a health problem that leads to a long-term disability. Most immediately, lack of sleep means you are more likely to make mistakes and, if you're performing a dangerous task that requires your complete attention (such as operating a motor vehicle), then a single mistake could be dire. Alternatively, diseases associated with sleep loss, including strokes and cancer, could lead to a lifelong disability that makes it difficult to earn a living or maintain a decent quality of life. If the above reasons aren't enough motivation for getting enough sleep, perhaps the fact that sleep loss has been linked to premature death will be. Especially in men, lack of sleep has been linked to a shorter lifespan. Most of us want to be around long enough to see our children grow up, reach retirement, and take part in all of life's moments, both big and small. Just an extra hour of sleep per night may be what ultimately adds years to your life. We need a certain amount of sleep each night and this should be easy for most of us, right? The solution is not as simple as it used to be; fixing a vitamin / mineral deficiency, exercise or getting a new mattress. 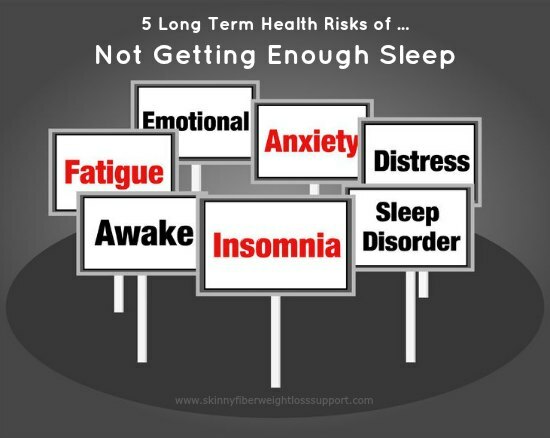 There are many different factors contributing to why chronic lack of sleep is an issue at particular ages and this is not as easily defined by the very same sleep experts sharing information that is supposed to help. - 50-70 million US adults have sleep or wakefulness disorder. This means that you are included in broken sleep even if your problem is just because your significant other keeps you up with snoring. Suffering From Sleep Deprivation / Insomnia / Broken Sleep / Anxiety / Obesity? I could go on and on with sources about how food, technology, sexual function and more are contributing to this sleep disease epidemic, but the fact at matter is that you understand that you (or your loved one) is not alone, as well as what the 5 long term health risks of not getting enough sleep are AND how it is up to you to get help to change this chronic sleep deprivation problem in your life. If you would like to discuss more, please feel free to comment below or you can ADD ME as a friend on Facebook and then message me to join our weight loss support group. You can also check out the product details of our HiBurn8 Night Time Formula to see if this is an option for you. Thanks so much for following and reading along! Please never hesitate to let me know if there is anything that I can research and write about specifically to help in your weight loss journey!